There are many causes of jaw pain, swelling, and discomfort that dentists will treat within their professional lives– but few like the one seen a month ago by doctors in India. When Ashik Gavai was brought into the hospital by his family after suffering from jaw pain for 18 months, his father feared the 17-year-old boy had cancer. Instead, surgeons found a benign tumor composed of 232 teeth. This type of tumor, called an odontoma, is not too common. Usually occurring in the young (the median age is 14), and associated with the occurrence of an unerupted tooth, odontomas are believed to be caused by normal dental tissue gone completely awry. Instead of making one tooth, the tissue forms multiples: 8, 16, and in the case of Ashik Gavai– 232. BBC News reported that surgeons at Mumbai’s JJ Hospital spent seven hours retrieving small, pearl-like teeth from the patient’s jaw, an extraction whose initial excitement was followed by almost tedious boredom– 232 is a lot of teeth! The article also includes some pretty graphic pictures of the extracted teeth; all of which are very unusual looking, to say the least. While this story is extraordinary– and it ends well– the team at Barrett Family Dental think it’s worth noting that Ashik Gavai waited an uncomfortable 18 months with teeth in his jaw before the astonishing recovery of 232 teeth by surgeons. Knowing this casts a bit of a pall over Gavai’s happy ending, knowing as we do that while preventative dentistry is the best step to great oral health, not everyone has access to this type of medical care. 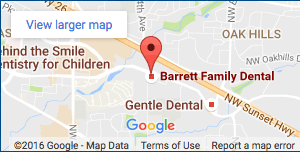 Fortunately, Dr. Barrett and the team do have the privilege of providing outstanding preventative dental care for our patients in Beaverton and the Portland Metro area. Make sure your dental appointments are up-to-date, and schedule your next visit today to the best family dental care Beaverton has!